Those letters were permanently etched across the knuckles of a teen named Diamond, a resident of Mid-Atlantic Youth Services in Clarion County in 2008. At least she thought they were permanent. She had other tattoos — gang tattoos. She was no longer affiliated with a gang, but the symbols put her in danger. A young man at the youth home saw her tattoos — symbols of a gang whose Philadelphia branch had recently killed one of his relatives. Though Diamond had nothing to do with the killing, the person attacked her. A caseworker witnessed the ordeal. She asked Diamond if she wanted to try to remove her tattoos. She did. The caseworker looked up East Side Laser Center and called Bridget Miller. The path that led to that conversation was similarly simplistic. Miller had been working in Haiti for more than three years prior to opening East Side Laser Center in Braddock. When she moved back to the United States, she was a bit lost. “When I left the job, I didn’t know what I wanted to do and I was depressed, so I typed in ‘businesses for women in their 50s,’ and tattoo removal came up,” she said, speaking matter-of-factly, as though basing a lifelong career on a late-night Google search shouldn’t raise any eyebrows. “I said, ‘Oh, well, I could do that — that sounds like a really good idea, especially tattoos, so let’s see where this takes us,’’” she recalled. Six weeks later, she was in Arizona taking a course to become certified in lasers — hair removal, age spots, broken capillaries — “I was afraid who would come to see me if I did just tattoo removal?” she said. She makes her money through the standard laser work, but tattoo removal is her passion. She said those with gang tattoos are often thought of as second-class citizens. Thus, the Erase Project was born — the side of Miller’s business that “removes inappropriate tattoos from visible areas of individuals who want to change,” according to the mission statement. Removing tattoos can be metamorphic, said Esmeralda Mendez, the director of tattoo removal at Homeboy Industries, a Los Angeles-based nonprofit that offers help with employment, job skills and other services to former inmates. 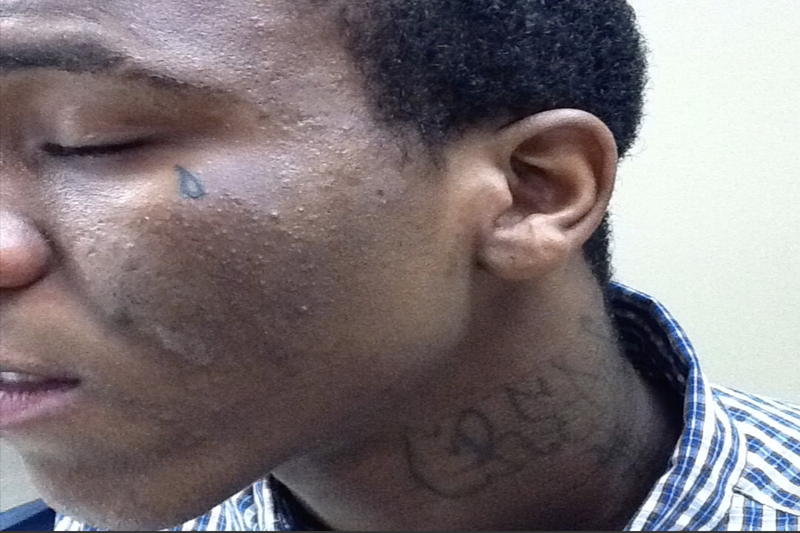 In that regard, tattoo removal can help eliminate the cycle of incarceration. “People need to sustain themselves in order to live,” Mendez said. Without employment or basic needs such as shelter, that’s not possible. The reasons for wanting tattoos removed can vary, she said. Other times, the removal is a way to move on. “For some people, it’s transformative in that, OK, you have your past but now you’re trying to do something different,” she said. For Miller, it doesn’t matter the reason. It’s a painful procedure — like having hot bacon grease poured on you, she said — and it takes multiple sessions to fully remove the tattoo. She said most people she helps give her a hug or a handshake. One brought her flowers and a thank-you note — that one made her cry, she said. And while it’s not necessarily her goal, she said, she’s also saving taxpayers money: It costs more than $40,000 a year to keep an inmate incarcerated, and studies have shown that access to employment helps reduce recidivism rates among ex-offenders. She figures that if helping remove someone’s tattoos can help them find employment, that’s also lowering the chance they end up back in jail, she said. “That’s doing a great service for the state,” and thus the taxpayers, she said. Miller runs her laser center in a rehabbed building in Braddock called the Hollander building — a former drug store that was turned into a coworker space full of women-run businesses. The equipment Miller uses for tattoo removal has been out of commission for several months, but even before that, she said, she’d fallen out of touch with those who could connect her with those wanting tattoos removed.